This happens EVERY. SINGLE. NIGHT. If In The Night Garden starts while she’s in there, she flies into an inconsolable rage, and when she’s finally freed herself she rips all her clothes off and punches a Pontepine. I have a #gin during story time to recover. Mine thankfully knows how to tip his over! What is it that's so funny about furious toddlers? 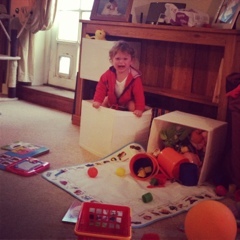 Mine does something similar and wedges herself into her Mega Blocks box at least a few times a week and whilst she rages at me, I can't help laughing (and obv taking a photo). What! …I think I now dream in Pontepines…. Hehe oh noooo bet the poor Pontipine dreads evenings!